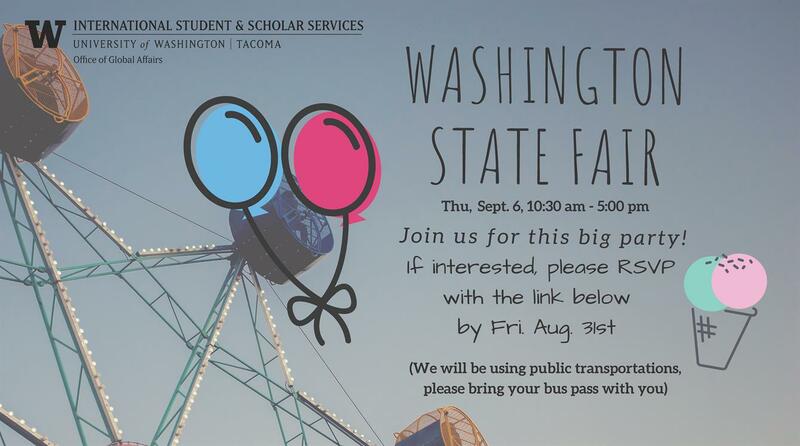 Thursday, Sep. 6, 2018, 10:30 a.m. – 5 p.m.
We are planning to go to the Washington State Fair this September 6! If you are a UW Tacoma international student, you are welcome to join our events before the fall quarter starts. This trip is a great way to meet other new and returning international students! ISSS will pay for your admissions ticket. Please bring cash to buy food for lunch and other activities. Note: We will take the bus to go to the Washington Sate Fair. Therefore, please bring some cash or your Orca card (your U-PASS will not be activated until Autumn classes begin). If you are interested in, please sign up here before August 31. If you have any questions, please contact uwtiss@uw.edu!